Once you're successfully set up with the BNZ PayClip terminal and posBoss, you're ready to take payments. To send a payment through to the PayClip, press Card as the payment type when paying an order, tab or account. The Terminal Connection window will appear and guide you through the transaction. The first time you connect, you will be prompted to allow "Posboss" to access your location. This is a requirement from BNZ PayClip. Press Allow to continue. A successful connection will display the payment amount in the PayClip screen. From there you can process the card payment. If a signature is required, the signature window will appear in the Terminal connection window on posBoss. The customer can sign using their finger. If you are happy that the signature matches, press Submit. Should they need to try again, press the Reset button and to cancel out of the payment, press the X button at the top left. 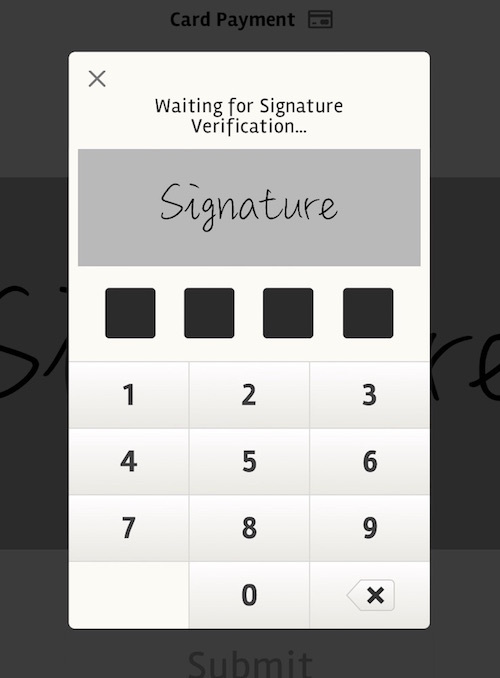 If you have enabled Signature Verification, you will be prompted with a keypad for the 4-digit manager PIN. Once the payment is successful, the Terminal Connection window will close and the posBoss transaction will settle.